The 2019 RAM 1500 and the 2019 GMC Sierra 1500 are both capable pickup trucks. But which one of these trucks is best for your daily needs? To help you make the best decision, we have put together a comparison review of both the 2019 RAM 1500 and the 2019 GMC Sierra 1500 in three criteria categories. In the first part of the review, we will take a look at the key exterior features. Next, we will venture inside and examine the key interior features. Finally, we will compare the horsepower of both the 2019 RAM 1500 and the 2019 GMC Sierra 1500. The 2019 RAM 1500 offers the following key exterior features: 18.0-Inch x 7.5-Inch Steel Painted Wheels, 275/65R18 BSW All-Season Tires, Automatic Headlamps, Low Beam Daytime Running Headlamps, Halogen Quad Headlamps, and Headlamp Off Time Delay. The 2019 Sierra 1500 offers the following key exterior features: 17-inch 255/70R17 all-season, blackwall tires, 17-inch full-size spare steel wheel with Black finish, Cab-mounted cargo area lamps, Cargo bed LED lighting, Chrome door handles, Chrome front bumper, Chrome rear bumper, Deep-tinted glass and Full chrome surround window moldings. While both the 2019 RAM 1500 and the 2019 GMC Sierra 1500 offer a number of key exterior features, the 2019 RAM 1500 offers more capable exterior key features than the 2019 GMC Sierra 1500. The 2019 RAM 1500 offers the following key interior features: 4 Way Front Headrests, 4-Way Manual Adjustable Driver Seat, Manual Adjust 4-Way Front Passenger Seat, Rear Folding Seat, Air Conditioning, Overhead Console, Passenger Assist Handle, Power Windows w/ Front 1-Touch Up and Down Feature, Rear Fixed Window, Vehicle Information Center, 5.0-Inch Touchscreen Display, 6-Speakers, Accent Color Shark Fin Antenna, and a Cluster 3.5-Inch TFT B&W Display. The 2019 GMC Sierra 1500 offers the following key interior features: 10-way power driver seat with power lumbar, 4.2-inch diagonal color Driver Information Center, 4G LTE Wi-Fi® hotspot capable, 6-speaker audio system, 8-inch diagonal Premium GMC Infotainment System, Assist handles, Bluetooth®, Carpeted floor covering, and Compass. Overall, the RAM 1500 offers more advanced technology and convenience interior features than the Sierra 1500. The 2019 RAM 1500 comes standard with a 3.6-Liter V6 24V VVT eTorque Engine that offers up to 305 horsepower and 269 foot-pounds of torque. This engine is paired with a 8-Speed Automatic 850RE Transmission. The 2019 GMC Sierra 1500 comes standard with a 4.3 Liter EcoTec3 V6 engine that offers up to 285 horsepower and 305 foot-pounds of torque. This engine is paired with a 6-speed automatic transmission. Overall, the RAM 1500 offers more standard horsepower and a more capable transmission than the Sierra 1500. 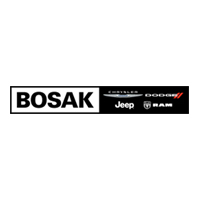 Bosak CDJR invites you to test drive the 2019 RAM 1500 and see how it compares favorably against the 2019 GMC Sierra 1500. Our experienced sales team are looking forward to showing you all the capable features of the Ram 1500. Call or stop by for a test drive today.